Here’s a month-by-month look back at some significant events in the life of Texas A&M International University for 2015. See embedded links for more detailed information. The University started the New Year by naming Rosanne Palacios as Vice President for Institutional Advancement. Palacios brought 25 years of experience in fundraising and marketing ranging from private, non-profit and public sector and spanning a broad range of diverse communities and philanthropic initiatives. Four TAMIU faculty members published new books on psychology, literature and public administration. Dr. Roberto Heredia, TAMIU professor of psychology and Dr. Anna Cieślicka, TAMIU associate professor of psychology, have launched their new book, “Bilingual Figurative Language Processing,” published by Cambridge University Press. Also recently published by Routledge is “Religion in Cormac McCarthy’s Fiction: Apocryphal Borderlands” by TAMIU Regents Professor and director of English and Spanish Programs, Dr. Manuel Broncano. A third book, “Public Administration Training in Africa: Competencies in Development Management,” was authored by Dr. Peter Haruna, TAMIU professor of public administration, and published by CRC Press Taylor and Francis Group. Loretta Swit, renowned for her funny and thoughtful role in the long-running hit TV series, M*A*S* H, presented an educational and theatrical performance as Eleanor Roosevelt as part of the TAMIU A. R. Sanchez, Sr. Distinguished Lecture Series. Written by Rhode Lerman, the show was an incredibly personalized, intimate portrait of the historic woman and the many challenges that surrounded Roosevelt. TAMIU’s Office of Public Relations, Marketing and Information Services wasnamed 2015 Platinum Winner in the Commercials/Ad Campaign category for its “The International U” TV video campaign produced with MDR (Morehead Dotts Rybak). PRMIS was also named 2015 Gold Winner in the Creativity (Web Design)/Website category for the University’s website, tamiu.edu. TAMIU College of Education Dean Catheryn Weitman was been selected to join an elite network of more than 6,000 women as a member of the Leadership Texas Class of 2015. “Dr. Weitman is one of 80 outstanding women leaders competitively selected from across the state to participate in the longest-running women’s leadership development program in the United States,” said Candace O’Keefe-Mathis, CEO of Leadership Women. Dr. Roberto Heredia, TAMIU professor of psychology, and Dr. Anna Cieślicka, TAMIU associate professor of psychology, were named editors for a future psychology book series for Springer International Publishing. As editors, Dr. Heredia and Dr. Cieślicka will be in charge of accepting and rejecting book proposals for the publisher’s series. In ceremonies in College Station, The Texas A&M University System Board of Regents honored 10 professors and seven fellows within the A&M System as Regents Professor or Regents Fellow for 2013-14, including TAMIU professor and director of English-Spanish programs Dr. Manuel Broncano-Rodríguez who was named 2013-2014 Regents Professor. More than 60 TAMIU students raised over $3,000 for Special Olympics Texas in 2015’s “Polar Plunge, and earned three trophies. The students were awarded trophies for most money raised by a group, best group costume and best individual costume. TAMIU College of Education professor Randel Brown led the annual charge for the event and joined the students in the Plunge. TAMIU’s Office of Public Relations, Marketing and Information Services won 11 new awards recognizing achievement in educational advertising and marketing. The Office received seven awards from the National 30th Annual Educational Advertising Awards, including Gold Awards for Imprinted Materials and TV Series; a Silver Award for Total Integrated Campaign; Bronze Award for Magazine Single Ad and Merit Awards for Logo, Outdoor Billboard and Annual Report. TAMIU also received four American Advertising Awards (known as ADDYs) from the American Advertising Federation, including Gold for Consumer or Trade Publication Campaign – Four Color; Silver for Television Campaign Regional/National and Bronze for Out of Home Campaign and Integrated Campaign Regional/National. TAMIU selected Dr. Guillermo Cruz Domínguez Vargas to direct the University’s planned growth in the College of Arts and Sciences’ School of Engineering, with specific interest in engineering and petroleum engineering. Dr. Domínguez, who has worked as a petroleum engineer, government official and academic will develop emerging engineering programs at the University. TAMIU ranked fourth among the “Top 100 Best Bang for the Buck” rankings of Southern Universities, according to Washington Monthly Magazine’s publication The Other College Guide: A Roadmap for the Right School for You. The rankings measure the schools that are the best value based on “net price,” which the guide explains is affordability and how well the universities do graduating students. Dr. Rohitha Goonatilake, mathematics professor and chair of the Department of Mathematics and Physics, was one of 11 professors from around The Texas A&M University System recognized by A&M System Chancellor John Sharp for significant contributions to the field of teacher education and inducted into the Chancellor’s Academy of Teacher Educators. TAMIU held the first ever family-friendly “Discover TAMIU” and invited the community to celebrate all things TAMIU. More than 200 TAMIU students participated in the 7th annual “The Big Event” which benefitted the South Texas Food Bank. TAMIU’s Online Master of Public Administration (MPA) program and Master of Business Administration (MBA) program ranked among the Top 50 in the nation for two different categories in a national survey conducted by TopManagementDegrees.com. TAMIU’s MPA program ranked No. 31 among the Top 50 Online Master’s Degrees in Public Administration 2015 category and the MBA program ranked No. 18 among the Top 50 Most Affordable MBAs 2014 category. TAMIU catalog librarian Nerissa S. Lindsey presented on metadata skills at the Texas Library Association Conference. Lindsey discussed cloud-based library management systems and how they impact the workflows of technical services, and the skills and qualities cataloging/metadata librarians need to handle the changes and its benefits. Laredo and TAMIU ushered in an innovative collaboration with dedication ceremonies for the TAMIU KLRN Studio, a digital learning laboratory, and a special advanced screening of a new documentary of “El Poeta.” The Studio enables expanded learning opportunities for the University’s Communication program, an opportunity to work collaboratively with KLRN Public Television of South Texas and a previously unavailable uplink capacity to provide Laredo content to other media outlets on demand. TAMIU hosted a rare and historic opportunity for students to partake in the First Annual International Mariachi Workshop and Concert, “México, Voz Que Canta,” with México’s revered Mariachi Nuevo Tecalitlán de Guadalajara. Many mariachi music students from local and surrounding areas attended workshops conducted by the Mariachi Nuevo Tecalitlán’s musical director, Fernando Martínez and the entire Mariachi Nuevo Tecalitlán. TAMIU College of Arts and Sciences Department of Fine and Performing Arts assistant professor of dance, Traci Klein, participated in a performance by Loteria Performing Arts at New York City’s Ailey Citigroup Theater. Klein presented original choreography and performed in various pieces of choreography and structured improvisations. She is a founding member of the project, which launched in 2012. TAMIU College of Arts and Sciences Department of Fine and Performing Arts will be able to bring more world-renowned musicians thanks to a $10,000 National Endowment for the Arts Challenge America Grant. This was the first grant ever awarded to TAMIU by the National Endowment for the Arts. TAMIU and Freer Independent School District signed a memorandum of understanding that established the Early College High School for Freer High School Students at TAMIU. Nearly 400 students presented at the TAMIU Lamar Bruni Vergara Guillermo Benavides Z Academic Conference. Graduate and undergraduate students gave a total of 249 presentations at the University’s premier annual academic conference. Six TAMIU student groups won top places for service-learning projects at the annual TAMIU Service Learning Expo. More than 200 students participated in the Expo. TAMIU hosted the iconic Los Tres Reyes in concert during the University’s Hispanic Heritage Concert Series. The group, one of the great trios of the golden age of Mexican boleros, performed romantic trio music for the event that benefitted student scholarships. TAMIU A. R. Sanchez, Jr. School of Business Dean Steve Sears showed his support for the School’s students by honoring his promise to kiss a pig as part of a student-led fundraiser. The event was organized by the Dean’s Student Advisory Council and raised more than $1,700. Methodist Healthcare Ministries of South Texas, Inc. announced its $13 million investment in South Texas’ health care delivery system project from which TAMIU will $1.7 million for each of the five years of the program’s duration. Out of 10 faculty members nominated by University Honors Program students Dr. Michael Kidd, assistant professor of biology, was named University Honors Program Faculty of the Year. TAMIU A. R. Sanchez, Jr. School of Business students traveled to Church’s Chicken Atlanta, Ga., headquarters where they garnered world-class corporate experience. It was all a part of their internship with the Newman Internship with Church’s Chicken, created by David T. Newman, Church’s Chicken franchisee. TAMIU hosted its first 5K Fun Run and Walk for employees to celebrate the second year of its Employee Wellness Program, “HealthyU.” The event was the culmination of an eight-week fitness challenge, and open to all University employees. Over 100 employees participated in the event. TAMIU’s Office of Public Relations, Marketing and Information Services was the recipient of two awards at the 13th Annual Public Relations Society of America Del Oro Awards held in San Antonio. The PRSA Del Oro Awards for TAMIU were the El Bronce Award of Merit for Other Social Media Category and the El Bronce Award of Excellence for The 2014 President’s Report (Annual Report category). The family of Irma M. and Daniel B. Hastings generously donated a portion of their orchid collection to TAMIU to honor the memory of their late grandparents, avid orchid collectors. The Hastings Orchid Collection will be housed in TAMIU’s Greenhouse, part of the College of Arts and Sciences, Department of Biology. Dr. James Norris, TAMIU associate professor of political science, was one of 160 winners chosen from more than 400 applicants for the Phi Kappa Phi “Love of Learning” grant. Trustees from the Lamar Bruni Vergara Trust announced a generous grant totaling $300,000 that will enable the expansion of the TAMIU Literacy Enrichment Center program. The LBV Grant will expand the existing program to three additional partner schools in both Laredo and United Independent School Districts aside from those already existing at Henry Cuéllar Elementary School and Honoré Ligarde Elementary School. The LEC strengthens reading and writing on elementary campuses by pairing elementary school students with TAMIU teacher candidates in a supervised one-on-one tutoring experience. TAMIU set a record with its Spring Commencement Exercises in which some 730 candidates for undergraduate, graduate and doctoral degrees participated. A total of 17 TAMIU systems engineering class students competed at the highly selective 2015 NASA Robotic Mining Competition at Kennedy Space Center. The team created “DustyTRON” as their Martian mining robot entry. A group of 14 students received a Certificate in Oil and Gas Accounting from TAMIU’s A. R. Sanchez, Jr. School of Business during a special ceremony. Students learned the importance of the oil and gas industry for the U.S. economy, the industry’s various accounting aspects, and elements of oil and gas exploration and production. TAMIU released its newest mobile phone and tablet application, “TAMIU Mobile.” The new app, available on iTunes and Google Play, was updated and redesigned to better fit TAMIU students’ and visitors’ needs. TAMIU assistant professor of history, Dr. Aaron Olivas, spent two months over the summer as a summer research fellow at the Huntington Library in San Marino, Calif. He received his appointment as an Andrew W. Mellon Fellow at the Huntington to conduct research for his upcoming book. Three TAMIU Spring 2015 graduates and one Fall 2014 graduate were accepted to law school. Affordable Colleges Online, an authoritative resource dedicated to online learning and college affordability, ranked TAMIU 22 out of 118 colleges in its annual rankings of the Best In State Online Colleges for 2015. TAMIU was one of two Texas A&M University System institutions that made it into Money Magazine’s newly released list of “736 Schools that Provide the Best Value for Your Tuition Dollar.” The two A&M System universities that were included in the list are Texas A&M University and TAMIU. TAMIU ranked No. 1 in the nation among the “Top 10 Colleges with the Highest Hispanic Enrollment” according to the U.S. News and World Report. TAMIU topped the list of 10 schools with the highest percentage of Hispanic students enrolled in Fall 2013, with the exception of U.S. colleges located in Puerto Rico. TAMIU College of Arts and Sciences School of Engineering students and Dr. Guillermo Domínguez, director of the School of Engineering, traveled to Azerbaijan to study the energy industry in the Caspian Sea Region. The trip was made possible through a historic agreement TAMIU signed with the Assembly of the Friends of Azerbaijan in April. TAMIU College of Nursing and Health Sciences’ Dr. F. M. Canseco School of Nursing, Dr. Marivic Torregosa, joined graduate nursing students Claudia Carolina Beltran, Crystal Botello, Jesse Coe, Amy Lorraine Guerra, Juan Lira and Victor Ramos as the students presented nursing research at an international conference in San Juan, Puerto Rico. Rolando Santos, TAMIU Office of Public Relations, Marketing and Information Services videographer/photographer, received three national awards in the Videographer Awards 2015 Competition. Santos received the Award of Excellence for his short documentary on the University’s innovative collaboration with México’s Mariachi Nuevo Tecalitlán de Guadalajara, the Award of Distinction for his animated campaign, “A Tale of Distinction,” and an Honorable Mention for his video documenting the University’s annual Celebration of Life. Laredo-born academic, researcher and writer Sandra Guerra Thompson held a book signing and lecture sponsored by the TAMIU College of Arts and Sciences Department of Social Sciences. Guerra Thompson is the author of Cops in Lab Coats: Curbing Wrongful Convictions with Independent Forensic Laboratories (Carolina Academic Press, 2015). Congressman Henry Cuéllar announced that TAMIU was awarded a $1.2 million federal grant for its TRiO Student Support Services program providing academic assistance to students in need. TAMIU faculty member Dr. Elizabeth Terrazas-Carrillo, TAMIU assistant professor, department of Psychology and Communication, received a grant for $6,200 from the American Psychological Association (APA) to explore cultural influences on attitudes towards partner violence among Mexican American college students. Melissa Cadena, TAMIU senior, chemistry, received the top prize for undergraduate research at the 250th American Chemical Society National Meeting held in Boston for her poster presentation on computational chemistry methods to study bromine halocarbons—greenhouse gases which lead to the breakdown of the ozone. TAMIU students Antonio Jimenez, junior, chemistry, and Marcelia Rosan, junior, biology, also presented at the conference. TAMIU was ranked 24 among Top Public Schools Regional Universities, West by U. S. News and World Report in its “2016 Best Colleges Ranking” and No. 70 among Regional Universities West among approximately 1,800 universities surveyed. The National Science Foundation awarded a grant of more than $59,000 to TAMIU to purchase equipment to enhance students’ research and training. Dr. Qingwen Ni, professor of physics, TAMIU College of Arts and Sciences, department of Engineering, Mathematics, and Physics, said the grant will give TAMIU a complete NMR system—low field NMR, high field NMR, and high field NMR with solid state probe. TAMIU professor of Spanish and author Dr. José Cardona-López traveled to Santiago de Chuco, Perú’s Poetry Capital, to participate in an international, multi-city literary conference and to receive the prestigious “Laurel Trilce de Oro” (Golden Laurel Trilce) Award from the Peruvian city’s mayor. TAMIU alumni Jorge Aguilar (BA, 2011) and Carlos Sánchez, (BA, 2004) were recognized by The Huffington Post’s “40 under 40”: Latinos in American Politics. The TAMIU A. R. Sanchez, Sr. Distinguished Lecture featured internationally acclaimed writer, scholar of religions and New York Times best-selling author Dr. Reza Aslan. TAMIU signed a memorandum of understanding which allows for collaborative educational efforts between TAMIU and five Mexican universities. It was signed at a binational energy roundtable that drew energy industry experts to campus. The roundtable, held by Congressman Henry Cuéllar, was the first event of its kind in Laredo. TAMIU was ranked number 21 in a 2016 ranking by Niche. The list is based on the insight of TAMIU’s most important constituents: its students. TAMIU Regents Professor of History Dr. Jerry Thompson published his newest book, A Civil War History of the New Mexico Volunteers and Militia (University of New Mexico Press, 2015), an exhaustively researched 939 pages and a hefty confirmation of his commitment to revealing little-known elements of the Civil War in New Mexico Territory. TAMIU honored all nurses with a special screening of “The American Nurse,” a feature length documentary that depicts the lives of five fearless nurses who serve on the front lines of healthcare, navigating their patients through birth, death, prison, war, and harsh poverty. TAMIU was been ranked the 6th Most Affordable Online Master's in Curriculum and Instruction (C&I) degree program by Top Education Degrees. As part of a Texas A&M University System initiative, a new TAMIU program will help students and graduates be as well suited as possible through the new Dustdevil Suit Bank. 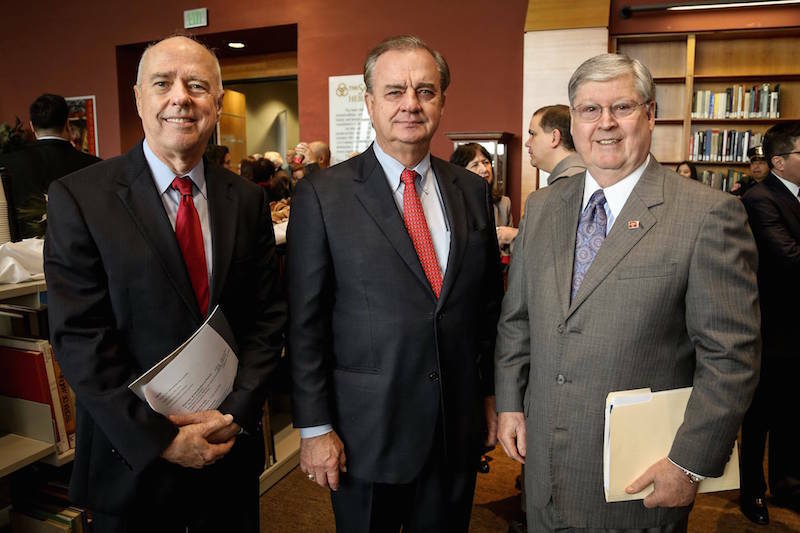 The Bank was made possible by Texas A&M University System Chancellor John Sharp and donations by members of the Chancellor’s Century Council, a donor group supporting special projects throughout the A&M System. The Mary Lamar Gallagher Leyendecker Endowment Fund Honoring Thomas and David O. Gallagher announced a $100,000 endowment to fund a new scholarship. It will enable children of LPD officers meeting established criteria to receive a four-year scholarship to TAMIU. TAMIU students garnered 14 awards and placed third overall in The Texas A&M University System’s 12th Annual Pathways Student Research Symposium held at Texas A&M University-Corpus Christi. TAMIU president Dr. Ray M. Keck was selected to attend an invitational conference at Yale University dubbed the Yale National Initiative to Strengthen Teaching in Public Schools. The Economist released its first-ever college rankings and TAMIU was ranked ninth among the nation’s Top 20 Colleges and Universities and is the only Texas institution in the Top 20. Dr. Bernice Sanchez, associate professor, received a two-year grant totaling $277,200 from the Write for Texas Agency, a partnership of the Meadows Center for Preventing Educational Risk, the Texas Education Agency, and the Institute for Public School Initiatives (IPSI). TAMIU awarded an honorary doctorate to famed Mexican journalist and author Elena Poniatowska, long considered Mexico’s grande dame of letters, received an honorary doctorate. TAMIU's Alliance for Good, which establishes service learning opportunities with local agencies, entered into agreements with eight agencies to provide enhnced student learning and development opportunities. LULAC Chapter 7 “adopted” students at Macdonell Elementary School’s Literacy Enrichment Center (LEC). The students received supplies and instructional resources for the program. This is part of the Macdonell Elementary School Literacy Partnership and the LEC, an initiative of TAMIU’s College of Education. The Literacy Partnership is also supported by a generous grant from the Lamar Bruni Vergara Charitable Trust. TAMIU’s Service-Learning Center initiated a new cinematic partnership between the Webb County Heritage Foundation (WCHF) and students in TAMIU associate professor Dr. John Dean’s Chicano/a Literature course. The partnership gave students an experiential venue for learning through the creation of short films. The resulting films were presented at the first-ever Border Short-Film Festival in a one-time screening. Dr. John Kilburn, associate dean of Research at TAMIU joined 12 other community thinkers and presenters during the inaugural TEDxLaredo at TAMIU. His presentation, “Anyone Can Be An Activist,” explained how he became interested in social activism. Dr. Claudia San Miguel, chair, TAMIU College of Arts and Sciences Department of Social Sciences, led a summer research program in Arizona to develop a screening tool to identify victims of human trafficking, especially LGBTQ minors. Dr. San Miguel, Lorena Zapata (TAMIU, ’14), graduate student, History and Political Thought, and Kristina E. Morales (TAMIU, ’13), graduate student, Criminal Justice, spent 10 weeks conducting research to create the diagnostic tool to help identify domestic human trafficking victims. The first volume of a series of cognitive science books on bilingualism and the multilingual mind and brain, edited by Dr. Roberto Heredia, TAMIU professor of psychology and Dr. Anna Cieślicka, TAMIU associate professor of psychology, was published. They both served as editors and co-authors of the book, “Methods in Bilingual Reading Comprehension Research” (Springer International Publishing). TAMIU Dance students flexed their critical thinking skills at a recent dance performance in San Antonio when they saw production of “Carmen.maquia,” a contemporary retelling of the novella and historic opera, “Carmen.” The experience further augmented the College of Arts and Sciences, Department of Fine and Performing Arts dance minors’ studies by providing a look behind the scenes and an opportunity to meet the dancers and ask questions. The production was performed by Ballet Hispanico, a dance company from New York City. Research by NAFSA, the Association of International Educators, showed that the 2014-15 impact of TAMIU’s international students in Laredo exceeds $4.6 million and supports 32 jobs. A TAMIU student received an award for his remarkable performance at the 19th Eugene Scassa Model Organization of American States summit in Lafayette, La. Carlos Alvarez, a graduate student of Criminal Justice, received the Distinguished Budgetary Statement (Secretariat for Administration and Finance) Award after presenting a mock resolution for the country of Perú in regards to its homeland security measures and policies to address poverty. The TAMIU Online Master’s of Science Degree in Criminal Justice Program ranked favorably in two separate online ranking systems that score the top Criminal Justice master’s degree programs in the nation. OnlineColleges.net ranked TAMIU’s Online MSCJ program No. 25 among the Best Online Master’s in Criminal Justice Degree Programs in the Nation. The Program also received a ranking of No. 31 on Value Colleges’ (valuecolleges.com) 2016 rankings of the Top 50 Best Value Online Graduate Criminal Justice Programs. TAMIU unveiled a remarkable legacy gift presented by The Matias De Llano Charitable Trust—a Heritage Edition of The Saint John’s Bible. The unveiling attracted a large crowd including members of The Matias De Llano Charitable Trust; Dennis Nixon, chairman of the Trust Committee of The Matias De Llano Charitable Trust; John Sharp, Texas A&M University System chancellor; Dr. Ray Keck, TAMIU president, and Jim Triggs, executive director of the Saint John’s Bible Heritage Program.